The Dark Sun has risen again on the parched, magically devastated world of Athas, bringing with it the new rules and mindset of Dungeons & Dragons 4th Edition. First introduced in the early 1990s during D&D 2nd Edition, Dark Sun was meant to be a brutal, unforgiving dark fantasy setting unlike anything the game had seen. Noble hobbits, wise wizards, and forthright knights gave way to a world devastated by an arcane apocalypse. Where once there had been a bright, green planet, there was now just sand and death. Civilization lived on in a handful of city-states dominated by all-powerful sorcerer-kings. Players took on the role of slaves, gladiators and other peons thrown to the bottom of society’s latter; the setting wasn’t about saving the world – it was about surviving it. It was also the first setting where psionics dominated the landscape, while magic was rare (and profane, as it caused the apocalypse that turned verdant Athas into a wasteland). The 4th Edition version of the game keeps much of the trappings of Dark Sun, and introduces new rules to make it harder for player to rely on their old tricks: there are fewer magic items, magic itself is discouraged, and many arcane rituals are curtailed or eliminated outright. Two new races are introduced – the human/dwarf half-breeds known as the Mul, and the insectoid bipeds called the thri-kreen – and almost all of the existing races are re-cast. Humans remain the ultimate survivor species, but halflings are now cannibalistic headhunters, the vengeful elandrin have been driven mad by the destruction of their feylands, their elven cousins are now nomadic merchants, and the dragonborn are the dray, magical beasts crafted by a sorcerer king. These are big changes, and they’re role-playing gold. They mess with people’s pre-conceptions, and I think that as both a player and a GM, it would be a heck of a lot of fun to play any of these races. Who wouldn’t want to be a halfling bounty hunter tracking down scumbags through the streets of Tyr, a chain of shrunken heads hanging from his belts? The book introduces other Dark Sun-specific tricks. Metal is rare in the desert world, so there’s a host of new bone, wood and stone weapons and armor. The book describes how chainmail, platemail and shields are recast in their Athasian equivalents, and offers an optional “armor overheating” rule that could cause a character to heatstroke if they were ever lucky enough to find and wear metal armor. There’s also a variant “weapon breakage” rule that reflects how much easier it is to damage a weapon in Dark Sun. Setting specific weapons include the alhulak (a flail that has a four-bladed grappling hook hanging from a rope on the hilt), the carrikal (a two-bladed axe made from bone) and the gythka (a thri-kreen staff that can double as a spear). There are a bunch of other cool player options as well. The book introduces “themes”, which are designed to represent a character’s “career, calling or archetype”. They’re a bit like low-level paragon paths, in that they offer theme-specific attack and utility powers for characters that can be chosen instead of their regular powers. They’ve got some excellent role-playing potential, introducing concepts like the Athasian minstrels, entertainers and diplomats who just might be assassins or covert agents as well. They have a suite of concealment and poison related powers that are perfect for those with more nefarious ends in mind. There’s the dune trader, representing those who make their living traveling between the oases of civilization, and whose powers aid them in business transactions as well as skirmish fighting and the templar, who are agents of the sorcerer kings of Athas. Other options include members of the Veiled Alliance, who are secretive practitioners of the arcane arts, and wilders, individuals with a particular aptitude for psionics. There are also three new racial paragon paths for races unique to Dark Sun: half-giant thugs, mul battle slaves, and thri-reen predators. It’s a good mix of options, and I think they do a good job of capturing some of the day to day aspects of life in Athas, where your personal and professional connections can be key to surviving. Athas was ruined by magic, and magic keeps on destroying it. The setting has two kinds of arcane power: preserving and defiling. Preserving is less powerful, but doesn’t damage the environment. Defiling draws upon life itself to fuel spells and can turn the surrounding land charred and infertile. Or at least, that’s what it should do. In 4th Edition, defiling magic is boiled down to simply allowing to re-roll an attack. I was expecting something more, something that would really tempt players and that might grow increasingly powerful as they progressed through the heroic, paragon and epic tiers. But while there are a handful of defiling powers and abilities, they all felt weak and underpowered. None felt like they epitomized the sort of power source that ravaged an entire world. And that was ultimately my problem with Dark Sun for 4th Edition: it felt like they pulled too many of their punches. The designers couldn’t bring themselves to revisit 2nd Edition’s brutality; 4th Edition characters are still overtly heroic, and have perhaps the best chance yet of rivaling Dark Sun’s sorcerer kings. The all-important balance that epitomizes 4th edition is maintained here, and while 4E fans may appreciate that, others will wish for more options to unlock the dark, brutal powers of Athas. I would love to have seen a Game Master’s chapter with some really cool (and game breaking) powers. Re-rolling an attack power just doesn’t cut it. The player’s section ends up taking up about two-thirds of the book. The rest is given over to campaign setting information. After the rich, extensively detailed feast that was the Eberron Campaign Guide, the Dark Sun book is a snack. Tasty … but not exactly filling. The region and city write-ups are sparser than I hoped. You get a basic overview of Athas and its geography, but details on the sorcerer kings and their templar henchmen are sketchy at best. At first this seemed a glaring oversight, but then I flipped through Dark Sun Creature Catalog and found that the last section there was given over to their write-ups. Even then, I found the content somewhat lacking; I’d hoped for full-blooded write-ups on par with the Monster Manual creature features which highlight the big-bad (such as Lloth in Monster Manual 3 as well as a small legion of servitors and henchmen). The Sorcerer-Kings get a scant two pages per entity, which is barely enough for some minimal background and a statblock. I’d gladly have sacrificed the book’s short 1st level adventure to be able to dig deeper into the setting’s dust-choked wastes and current-day struggles, and I would have loved some generic low-level templar write-ups. These drawbacks don’t cripple the book, they do make it frustrating, especially after seeing how good a 4E campaign book could be with the Eberron Campaign Guide. 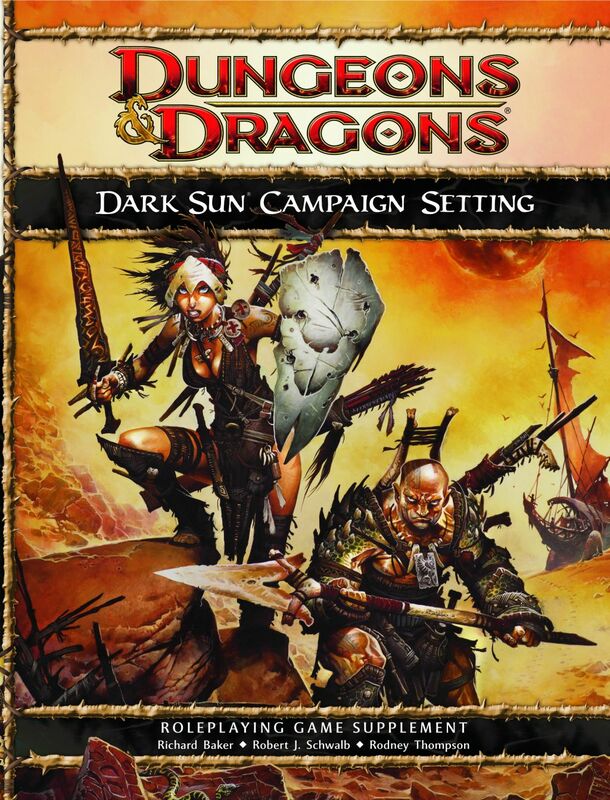 The Dark Sun Campaign Guide isn’t a bad book, and it certainly gives players and game masters what they need to run a game. It remains a unique setting, but it feels defanged in comparison to its predecessor. While I understand why they chose to release a campaign guide and a creature catalog, I’d much rather have had them retain the previous split and released the new critters in a Dark Sun-inspired Monster Manual 3. If you want to break your D&D game out of its fantasy rut or if you want to try something unlike any other setting out there, Dark Sun is a good choice. Just be prepared to house rule that essential Athas lethality back into your campaign.